When Atlanta Journal-Constitution hockey writer John Manasso's book Season of Loss, A Lifetime of Forgiveness: The Dan Snyder and Dany Heatley Story came out back in 2005 (courtesy ECW Press), I must admit I wanted nothing to do with it. It was one of the few hockey books I did not buy that year. The tragic accident and the loss of Dan Snyder's life is pretty serious and depressing stuff, and I elected to pass on it. I did not want to deal with it at all back then, tuning out news casts and passing on print and online articles. It was just too sad. It was not until 2007 that I picked up a copy of the text, and even then I only did because I found it in a bargain bin of a Vancouver used bookstore. Don't tell Manasso - I got it for only $2. Even then I still was not prepared to deal with the story. I put it on my shelf and did not pull it back out until now, the summer of 2008. For reasons I still can not ascertain, I suddenly felt that I was ready to deal with the story. It may have something to do with Luc Bourdon's tragic motorcycle death this summer. As a Canucks fan, I knew a bit about Luc Bourdon and what a great kid he was. I knew next to nothing about Dan Snyder, and I think I felt guilty about that. I guess it was time that I finally honour Dan Snyder's memory and learn as much as I could about Dan Snyder and his amazing family. There is no better place to do exactly that than Manasso's A Season Of Loss. 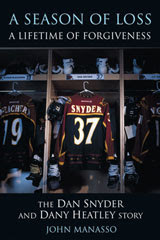 It is an expertly penned book that looks beyond the life and tragic death of Snyder, but also into Dany Heatley's ordeal and how the Snyder family forgave him and welcomed him into their home. The book opens with the infamous Ferrari crash, which is a little abrupt but somehow very fitting. After all it is here where most of us will remember Dan Snyder. It certainly grabs the reader's attention right away. Manasso even includes transcripts of the 911 call by the first person on the scene. I must admit that I tried to read through that, but I skipped ahead because I was not ready for that much realism. The next two chapters take turns looking at the two main characters of the story - Snyder and Heatley. The two are portrayed as very different people off the ice, almost as different as they are on it. But Snyder and Heatley, the driver of the Ferrari, became the best of friends and will be forever intertwined in history. As much as this is Dan Snyder's story and the Snyder family's story, this is also very much Dany Heatley's story. Somehow he survived the crash with a broken jaw, a minor concussion, a bruised lung, bruised kidney, and three torn ligaments in his right knee, but every day of his life he has to live knowing his mistake took the life of his best friend. Manasso does a good job of trying to tie the stories of Snyder and Heatley together. He had no easy job in doing that either, as Heatley declined to participate in the book's creation, never even answering Manasso's requests for interviews. Of course, at the time Heatley faced lengthy legal battles, and he was advised to say nothing at all to the media by his lawyers. After establishing the characters and their great bond, the book returns us to the hospital where Snyder fights for his life but ultimately can not hold on. The funeral is held back in Elmira, Ontario, a tiny Mennonite community that is greatly shaken by their hero's death. The final several chapters, which represents the bulk of the book, turns to the story of the community's healing process, and of course especially that of the Snyder family. The Snyders were quick to publicly forgive Heatley, something that surprised many people. They did not just publicly support him, they brought him into their home and they helped each other heal together. I'll admit, the chapters about healing and forgiveness and justice were a bit laborious, but that is completely my fault, not Manasso's. It goes back to my feelings that prevented me from reading this book for three years. Even when I read it I could not understand (I did not want to understand?) how this family was able to embrace forgiveness and accept what had happened so quickly. Perhaps this is because I do not want to ever find myself in their position. I don't want to relate to them. Because of my own misgivings I was not able to invest my full emotions into this book, making it at times a tough read. I almost want to apologize to Manasso because he did an absolutely fantastic job authoring this book, but I am not yet fully able to appreciate all that it is worth. I think the thing I may take away from this book the most is the quote by Snyder's junior teammate Ryan "Sticks" Christie. "Nothing Loved Is Ever Lost." Undoubtedly some great and famous philosopher actually coined that phrase, but Christie is the one who taught it to me. What a comforting thought to carry with us through not only loss, but how we approach every day we live. The Dan Snyder story is a sad one. But at the same time it is a hopeful story.